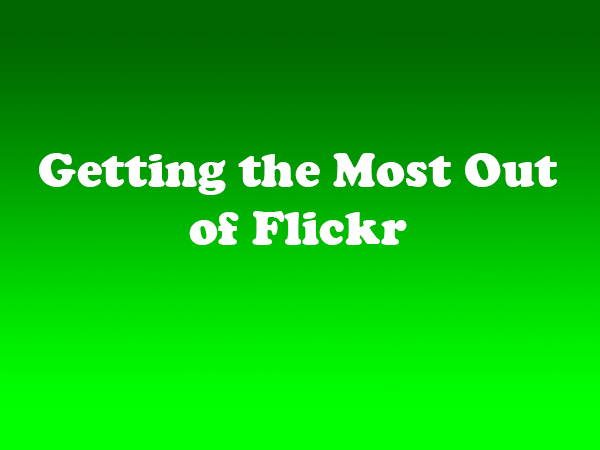 Flickr is one of the most popular websites for posting and sharing photographs on the Internet. However, despite the application’s widespread popularity, many users are unaware of the full range of features web site offers. Flickr allows users to upload up to 20 MB a month for free. If users want additional storage and features, the application offers an upgraded Pro Account for only $25/year. To get started, simply create a profile and upload pictures using a web browser on your computer or directly from a camera phone using email. Last year, Flickr also introduced an iPad app, which was named to the Best of 2014 list by Apple’s App Store. After uploading photos and/or videos, you can tag them using captions or key terms (i.e. Christmas 2014, Hawaii Vacation, Summer Sunset, etc.). You can also select the privacy level from one of the following: Public, Visible to friends, Visible to family, or Private. Flickr also allows users to share photos on other platforms, such as Facebook and Twitter. To share your photos with family and friends via Flickr, you can send invites to view your photo stream, which displays the last 200 images uploaded. Flickr groups, both public and private, also serve as a great way to share photos. In private groups, members can view and add photos on one platform, making it easy to share pictures of weddings, birthdays and other special events. Public groups allow users to meet and exchange photos with people who have common interests such as photography, sports or cooking. For businesses, Flickr offers the opportunity to market products and services. As the site’s best practices note, “companies should upload fresh, authentic material rather than product shots or staged, over-produced content that would be more at home in your product catalog or latest advertising campaign.” The point is to interact with customers by sharing unique images that may not be available elsewhere, such as behind the scenes photos and videos.